Table 3.2. Summary of probabilistic estimates of climate changes and yield impacts to 2030 relative to 1990 (data from Tebaldi and Lobell, 2008). impacts will produce more as their comparative advantage improves. Percentage changes in production will therefore be smaller than average yield changes, while total economic impacts could be smaller or larger depending on price effects. To fully sort out the eventual price and economic effects requires a model of global trade responses. For example Rosenzweig et al. (1993) estimated regional changes in grain crop yields, and then fed these into a global trade model to simulate market responses. The resulting global production change was much smaller than the average of regional yield changes, with the average computed by weighting each region by its production in the current climate (Table 3.3). Depending on the climate scenario, which dictated both the overall impact and the regional distribution, trade was able to buffer production shortfalls to only roughly one-quarter to one-half of the initial yield change. Yet significant price increases remained, ranging from 24 to 145% for the three scenarios the authors considered, far greater than the percentage drops in yields. (BLS) world food model) provides a reasonable representation of global trade. The 5th percentile yield scenario would result in roughly twice as much price increase, while the 95th percentile would have no net effect. Interestingly, the Rosenzweig et al. (1993) study reported a roughly constant proportionality between price increase and increased prevalence of hunger, with a 1% increase in malnourishment for each 2.5% increase in cereal prices. If we again trust these numbers, then the median outcome for 2030 would be an additional 10% increase in malnourishment, with a 'worst case' of roughly 20%. There are, of course, important reasons not to completely trust any of these numbers. In particular, global trade models that rely on equilibrium assumptions will miss entirely the potential exacerbating effects of policy responses or the influence of investors speculating in commodity markets. Both of these were believed by many to play an important role in the 2008 food price increases. Moreover, many other assumptions in economic models are not adequately tested. The above narrative is mainly intended to provide some intuition on the magnitude of possible effects and the important mechanisms involved. Current work is ongoing to understand in more detail the propagation of yield changes throughout the global economy, and the eventual impact on regional and global commodity markets, poverty and hunger. Table 3.3. Summary of impacts of doubled CO2 on average yields, production, prices and number of malnourished (adapted from Rosenzweig et al., 1993; Rosenzweig and Parry, 1994). a GISS, Goddard Institute for Space Studies (4.2, 11); GFDL, Geophysical Fluid Dynamics Laboratory (4.0, 8); UKMO, United Kingdom Meteorological Office (5.2, 15). 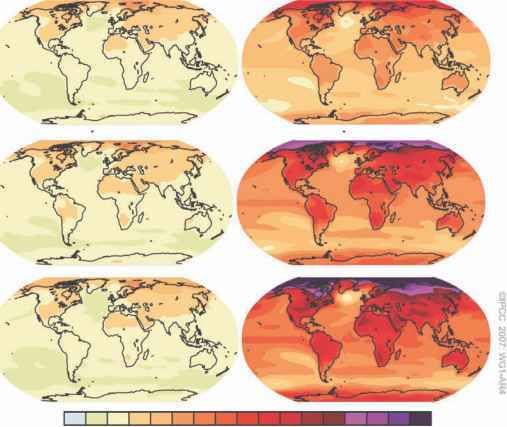 Numbers in parentheses are global average change in temperature (°C) and precipitation (%) for each model. climate change on average global cereal yields by 2030. As pointed out by Tebaldi and Lobell (2008), this conclusion is somewhat more pessimistic than the conclusions of the IPCC, which states that temperate regions will benefit from climate change up to 3°C (Easterling et al., 2007). In part this is simply a difference in emphasis on scales -the IPCC states benefits for temperate regions while noting that losses in tropical regions will tend to negate these gains. Equally, the disparity also probably arises from the inclusion of adaptation in many of the models used by the IPCC, although as we note above these positive effects could be cancelled by negative factors not considered in most models. Other factors, such as optimistic assumptions of CO2 fertilization in some models, may also play a role. In summary, climate change appears very likely to cause downward pressure on average global yields by 2030. The economic impacts of these yield changes are difficult to estimate but could be considerable, with as much as a 35% increase in prices. Although these estimates do not include potential gains from autonomous adaptation, they also omit other potential negative factors such as increased climate variability, pest damage, and reactionary policy interventions such as export bans in bad years.